I actually wrote out my pattern! 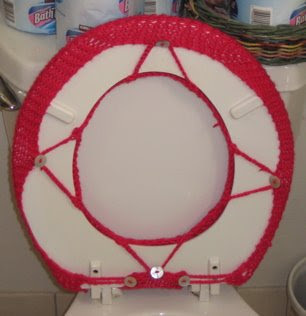 I was getting a lot of hits on my infamous toilet seat cover, and I wanted to make a new one with “improvements,” so I paid attention and wrote things down as I made the new one. 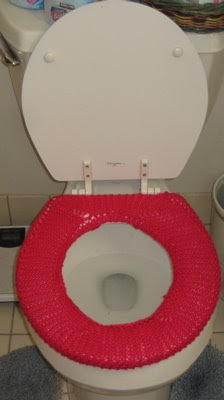 This was originally based off the Potty Mouth toilet cover, but I altered it to fit over the seat instead of the lid. 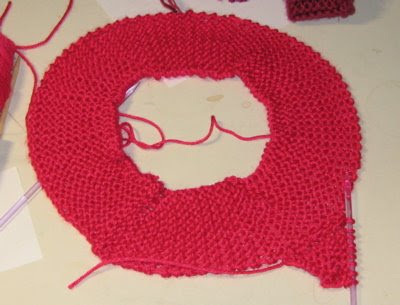 I suggest using acrylic yarn because you’re going to be washing this often. Needle: I used US 8, but you can use whatever needle size is recommended by the yarn you’re using. Gauge: Not that important. Mine was 4 sts/1 inch in garter stitch. 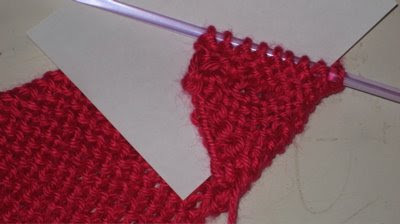 Using a provisional cast on, cast on 12 stitches. RS row: K until work measure three inches from the short rows. RS row: K until work measure 8 inches from the second set of short rows. 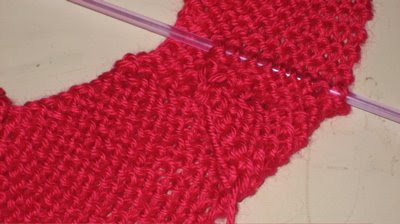 Move provisional CO stitches from waste yarn to a needle. Bind off with kitchener stitch. Here is a picture of the cover from the backside (WS), the "top." You can see the short rows. 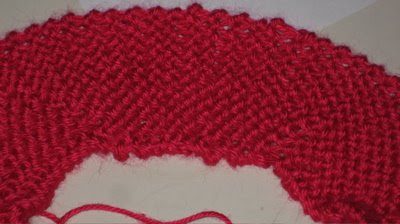 Here is a picture of the kitchener stitch bind off. 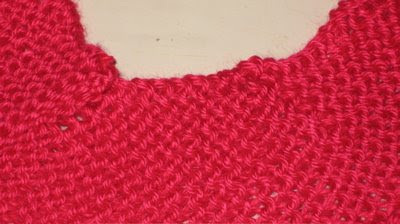 Another view of the "bottom" and the kitchener stitch bind off on the left side. I knit the lip liner to the edge of the cover as I went, similar to knitting the edging onto a lace shawl. This is why I slipped the stitches for every row when knitting the cover—so that I’d have a slipped stitch to pick up on the edge and knit to the outer edge of the lip liner. You do not have to do this. If you’d rather knit the lip liner separately and then sew it to the edge of the cover, you can do that. I happen to hate sewing, mostly because my rows never match up, which is why I did it this way—this ensures the rows of my lip liner match up with the rows of the cover. Here are a few pictures of the lip liner. I took these right after I'd finished the first section of short rows. Here is with a piece of paper between the seat and the lip liner so you can see better. Sl1, k6. Turn. Sl1, k6 again (knit last stitch to the outside edge of the cover, total 7 sts). Sl1, k5. Turn. Sl1, k5 again (knit last stitch to the outside edge of the cover, total 6 sts). Sl1, k4. Turn. Sl1, k4 again (knit last stitch to the outside edge of the cover, total 5 sts). Sl1, k3. Turn. Sl1, k3 again (knit last stitch to the outside edge of the cover, total 4 sts). Bind off. For last two stitches in bind off row: Slip last stitch through back loop, pick up a stitch from the edge of the cover, then pass the slipped stitch over. 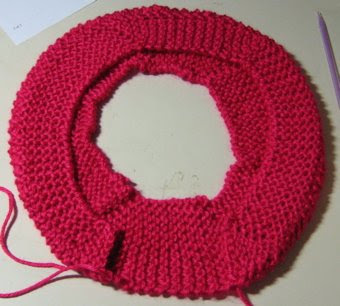 Then bind off the stitch as normal. 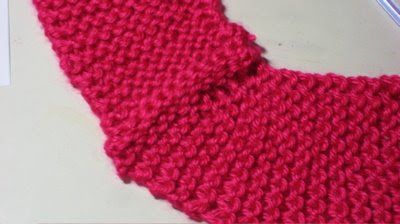 Pick up and knit about 9 stitches (give or take a few) along the bottom edge of the cover (at the six o’clock position. Knit 7 or 8 rows. Bind off. You might want to adjust these rows depending on your yarn and gauge and how wide your cover is already. Bind off very loosely. I used a US 15 needle tip to bind off. Make two i-cords or crochet chains each about 5 inches long and attach them as loops to the 5 o’clock and 7 o’clock corners of the lip liner. Sew buttons to top corners of bottom piece. The chains on the 5 o’clock and 7 o’clock corners of the lip liner will attach to these buttons underneath the seat. Sew button to top middle (6 o’clock) of bottom piece. Sew buttons to 12 o’clock, 3 o’clock, and 9 o’clock of lip liner. Make two i-cords or crochet chains each about 4 inches long (may need to adjust depending on your toilet seat) and attach them to the cover. Attach one chain at 1 o’clock and 11 o’clock, and attach the other chain at 5 o’clock and 7 o’clock. I attached them near the 4 short row sections. Make two i-cords or crochet chains each about 5 inches long (may need to adjust depending on your toilet seat) and attach them to the cover. Attach one chain at 2 o’clock and 4 o’clock, and attach the other chain at 8 o’clock and 10 o’clock. The two chains will reach under the seat and attach to the buttons on the lip liner. The chain at 1 o’clock and 11 o’clock will attach to the button at 12 o’clock. The chain at 5 o’clock and 7 o’clock will attach to the button at the top middle (6 o’clock) of the bottom piece. The chain at 2 o’clock and 4 o’clock will attach to the button at 3 o’clock. The chain at 8 o’clock and 10 o’clock will attach to the button at 9 o’clock. I can't believe I am actually sharing a picture of my toilet, but I can't think of any other way to show you how it fits onto the seat. WOW, look at you. Writer extraordinaire and knitter. That's awesome! Happy Friday! Oh my goodness! Impressive and creative. If I were a better knitter, I might try it. I'm sure it'd make an entertaining gift, too, for that "hard to buy for" person. Camy- my grandmother did a seat warmer in crochet years ago! She never wrote it down though. Here's a tip- she did a top and bottom- 2 pieces essentially, then sewed the INSIDE edges of BOTH pieces together and used Velcro tabs all around the outside edges to secure the top to the bottom, securing it to the seat in that way and it never shifted, slid or anything. Every few days we just separate the Velcro tabs, remove it, secure the tabs back together once it's removed and throw it in the washer. The thing is wonderful. We used it last winter but my mother put it up in such a good place that we can't seem to find it now. Hence my search to find a pattern. I knit, so this would be perfect- but is there anyway to update it using a top and bottom piece, then sew those 2 pieces together at the INSIDE edges and attach the Velcro tabs to the outside edges? What was great about how she did it was that it had Velcro tabs on each side at the back, but then also had tabs in the center of the back to secure it around the seat hinges. Like I said, she made this nearly 40 years ago and it's still in great shape! :) Wonderful, sweet Nana. If only she'd written her pattern down. We can't even go by the one she made until we actually FIND the dang thing! LOL So is there any way to adjust this pattern to how she did it? I'm no good at creating patters- but I sure can follow one! Gosh, I don't know! That's a good idea, though. 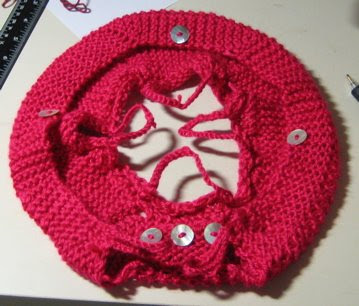 If I have time I'll look into an alternate pattern with the attached side on the inside ring. Haha, oh wow, that's awesome! :) Definitely not for in a house with boys, though!! !